Has TNT lost their mind. This is actually one of the only shows that TNT has that’s on my can’t miss list. I love this show! The characters are fully developed, real and thorough. This is absolutely one of the best casts on TV today. Very well rounded and cohesive. Together they really are a complete team. Please do not cancel this show!!! I do not think this series should have been cancelled. The series is something we look forward to and having long lasting characters that are superbly acted adds to writing. Maybe another channel will pick them up?. Not sure why the studio would think darker series would be desired. What is wrong with the stationSHAME on YOU!!!! This is a great show I loved it from the start when it was the Closer. Why is it when there is a good program it gets cancelled. I even watch reruns. Shame on you for canceling this show. Love the show. Hope Netflix or another streaming network will pick up. We are moving more an more in the all streaming services. Shame on TNT for cancelling a really popular show? Shame on TNT for cancelling yet another great tv show. With the ending of Major Crimes I will no longer watch TNT. The network continues to make bad choices on what they think viewers want to see. Bye bye TNT. This is my very favorite show. It makes me laugh and keeps me in suspense. Tremendous stories and great actors. Why are they cancelling this great show??? 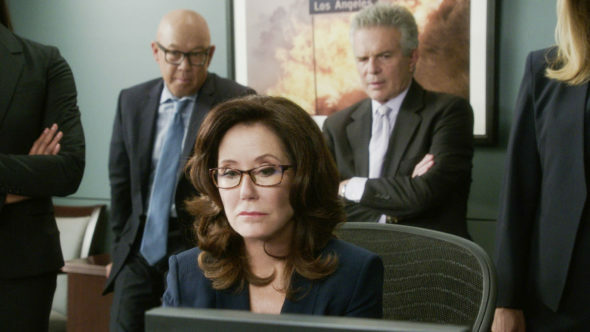 That TNT has cancelled Major Crimes doesn’t surprise at all. They have to make another slot open up for the more “edgy” (TRASHY!!) programming that seems to be the norm now. Thankfully I have purchased the DVDs of Major Crimes so I can watch my favorite cable show any time I please. Nothing else on TNT that interests me, so they can say good-bye to another viewer. Thanks to creator, cast, and crew for the AWESOME work you’ve done. Major Crimes is a quality show with quality writing and performers year in and year out. TNT has failed to promote Major Crimes for years, has moved it all over the TV schedule and yet it has still performed. Imagine if Major Crimes had been on a network that actually liked it and supported it. Perhaps there would not be a question of renewing contracts. In this era of TV there seems to be enough room for everyone’s TV taste. Shame on TNT. Major Crimes is one of the best series on TV. There are so few quality shows. Not everyone likes game shows or dancing or singing shows. Dramas are so few and far between. I can’t understand why the network would cancel such an excellent series. Shame on you. Even with the way this show has been moved from one time slot to another every season it has still managed to attract millions of viewers. Please reconsider canceling this show!